Autumn is the time to examine lawns for signs of summer wear-and-tear, and treat if necessary. At this time of year, any treatment has time to take effect before temperatures fall and growth stops. Any lawns, including formal lawns and hard wearing lawns. Any treatment is best carried out during September, when there is time for the grass to respond before the soil temperatures fall and growth terminates for the season. Regular raking (or scarifying as it known) keeps levels of thatch (old grass stems, dead moss and other debris) at an acceptable level. Layers of thatch greater than 1cm (3/8in) deep can impede water and fertiliser penetration. To remove thatch, rake vigorously but carefully with a spring-tined rake. For larger areas powered tools are available as single units or mower attachments. Note: Turf is damaged if scarified too deeply. Do not scarify in spring - opt instead for a light raking, as the lawn may not recover in summer conditions. Aerating (or spiking) lawns allows better movement of air and water in the root zone. A well-aerated lawn will manage better in periods of drought or waterlogging. For an average lawn, aeration every two to three years should be adequate. Concentrate on areas that receive the most wear and those that are compacted. Small areas can be spiked with a garden fork, spacing holes 10-15cm (4-6in) apart and deep. On clay or waterlogged soils use a hollow-tine aerator every three to four years. This extracts plugs of soil from the lawn. Hand held and motorized hollow tiners are available. After hollow-tining, sweep up the plugs and then rake a top-dressing (see below) into the holes to improve air and moisture penetration. Top-dressing is the application of loam, sand and well-rotted organic matter to a lawn in order to correct surface irregularities and improve the texture of difficult soils. This encourages greater rooting and thickening of turf. The top-dressing mix is three parts sandy loam, six parts sharp sand and one part compost or leafmould (by volume). Apply 2-3kg per sq m (4.4-6.6lb per 10 sq ft), working the dressing in well with the back of a rake. To correct bumps and troughs, use an edging iron or spade to slice through the turf and roll it back. 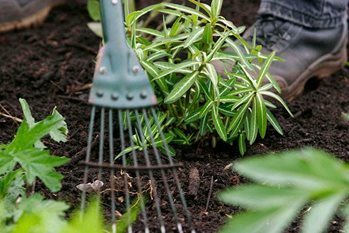 Fork over the underlying ground and add or remove soil as needed. Replace the turf, pressing the edges together, and water thoroughly. Lawns can suffer from a variety of fungal problems including red thread, fairy rings and take-all patch. Damage created by lawn pests such as leatherjackets and chafer grubs, as well as their predators, can be really devastating. Worm casts are also a nuisance in wet weather. Autumn is a good time to repair damage caused by fungal diseases or pests. Slime moulds and lawn lichens and other growths can be a real problem after a wet season.